It premiered in the new 2014 Mercedes-Benz S-Class and now chickens show what Magic Body Control is all about. What do chickens doing a bizarre dance and the 2014 Mercedes S-Class have in common? It’s called Magic Ride Control and the chickens do it well. Mercedes-Benz is starting a brilliant TV ad using dancing chickens to show just how good the new 2014 S-Class really is. We've seen Kia do it with Hamsters and now Mercedes with chickens. What will Mercedes try to prove with the new chicken ad? This bizarre dance is followed by the claim: "Stability at all times. Magic Body Control". The dance performance is performed by real chickens along with the help of some human hands. But the ad shows the body of the chickens moving while their heads remain stationary. The feathered specimens move to the beat of Diana Ross's "Upside Down", but they only move from the neck down. Their heads remain totally rigid. Anyone who has grown up on a farm has seen chickens actually do this move. The new TV ad will be aired starting today online and on TV around the globe starting at the end of September. The “quirky presentation” will show just how good the Mercedes-Benz suspension that made its world premiere on the new S-Class really is. It’s the world's first suspension "with eyes", which scans the road ahead for unevenness and adapts to the detected surface conditions automatically. Mercedes tells us the spot was produced by Markenfilm and directed by Daniel Warwick. Warwick, who is famous in the field of advertising and promotional films, also directed the current "smart offroad" commercial, which has already scooped nine gold awards, including at the Cannes Lions International Festival of Creativity and the Art Directors Club 2013. 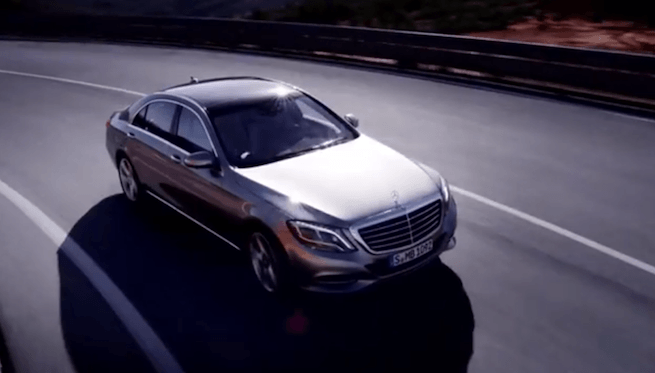 The dance performance by real chickens give us a good idea how the new Mercedes-Benz Intelligent Drive Magic Body Control ensures optimum driving comfort in the new 2014 Mercedes-Benz S-Class. Mercedes tells us no chickens were harmed in the making of this TV ad. What do chickens and Mercedes-Benz have in common? Stability at all times.